The movement of the moment is that of The Hipster. Not just a generic term for a style of jeans, women’s underwear or someone that is cool, a Hipster is the defining subculture of these times. Every generation can be defined by iconic subcultures; think the 70’s and Disco kids and Punks, 80’s with Hair Metalists and Nu Wavers, the 90’s with Grunge and Gangsta’s and the early 2000’s offering of Emo. It was my wife who recently drew the strong comparison of the twenty something Hipster’s to their Hippy forefathers of the 60’s. We were discussing the jokey irony of giving our new baby boy the middle name “Adventure”. She pointed out that in 20 years time, he will most likely dismiss this name with disdain blaming it on his ‘Hipster Parents’ and his friends Anchor and Cassette will nod knowingly. Because when we thought about it, what is different to our post-modern ironic joke name compared to the 60’s idealistic Hippie names of Wheatgrass, Eternity and Cloudwaver? 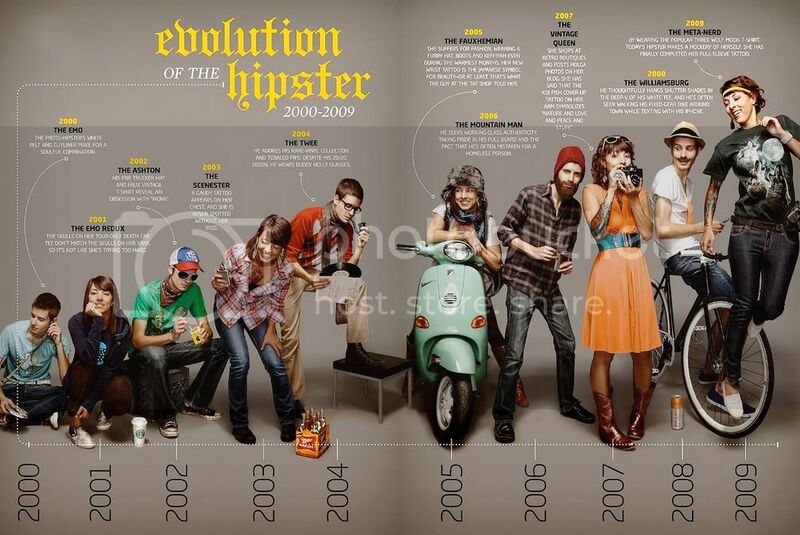 The Hipster movement is clearly an update of the Hippy movement. They wore flares, Hipsters skinny jeans. For the Hippy love was free, and for the Hipster it’s online. They would change the world with protests and folk songs, Hipsters would create their own world out of op-shop finds and retro camera photography. LSD was the drug of choice for the hippy, while the Hipster is influenced by their therapist’s choice of drugs. Hippies got around in Combi Vans fuelled with flower power, while the Hipster prefers pedal power from fixed wheel bicycles. Facial hair is something both tribes have in common, although this hardly seen of the female Hipster like it was the female Hippy. So what can Hipsters learn from the eventual fate of the Hippies? That most will grow up, forget why they cared and at occasional birthdays listen to Vampire Weekend songs and swear it’s the best music ever made while their son Anchor points and laughs at the ‘stupid old Hipsters’! Sure there will still be the old leftover diehard who refuses to change. They will remain in suburbs like Williamsburg and North Fitzroy, remembering the good old days of community vegetarian cooks ups and launches of friends blogs, gazing back on the past through their non-prescription blackframes and sleeping on copies of Frankie Magazine.